SUGARFISH by sushi nozawa, with multiple locations in Los Angeles and New York, is a different kind of sushi dining experience. Our restaurants serve only traditional sushi of the highest quality based on Chef Nozawa's style of sushi. Our passion is to carry forward his great tradition and style of food – which many believe is the best sushi there is. 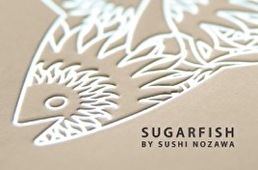 SUGARFISH gift cards cannot be used at KazuNori or Nozawa Bar. For balance inquiries call the phone number to a SUGARFISH's location below.